Today’s current dirt super late models feature steel constructed tube frame chassis with aluminium bodies that give them the sleek aerodynamic appearance of a stock race car but there is nothing stock about these 2300 pound machines. The cars are powered by an 850 horsepower motor than can turn in excess of 9,000 RPM. The engines are based on V-8 Chevy, Ford, and MOPAR power plants. 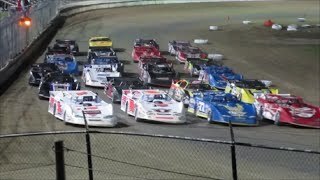 These cars are considered to be the most sophisticated cars in dirt racing. They hit speeds well over 100 mph and slide around the dirt corners. They are raced on dirt tracks throughout the country anywhere from 1/4 to 1/2 mile. The expense for these cars is extremely high. The cost for one complete race-ready late model is around $70,000. There is also cheaper equipment and parts that can be purchased, but staying competitive is much more expensive. To get the frame (chassis) and parts all new without the transmission and motor is around 20,000 to 30,000 dollars depending on the quality and from which manufacturer the chassis comes. The manufacturers around the country include Rocket, Sweet-Bloomquist, Club 29, Longhorn, Moyer’s Victory Chassis, Black Diamond Racecars, GRT, Warrior, Barry Wright Racecars, Rayburn, MasterSbilt and Swartz Race Cars. The engines for these cars are around 850 horsepower and can cost up to 40,000 dollars. Motor builders include Hatfield Racing, Durham Racing Engines, Cornett Racing Engines, Gaerte Racing Engines, Clements Racing Engines, Custom Racing Engines, Vic Hill Racing Engines and Pro Power Engines.